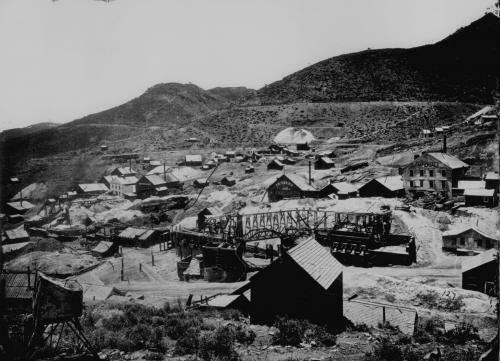 This view looks to the west over the mining town of Gold Hill, just a couple of miles south of Virginia City. The year is 1867 or '68, and the Big Bonanza is in full swing. In another year or two, in 1869, the Virginia and Truckee Railroad will come to town, gouging its right-of-way out of the big hill in the upper center of the photo. It looks like work may have already started, judging from the scar that can be seen cut into the hill.